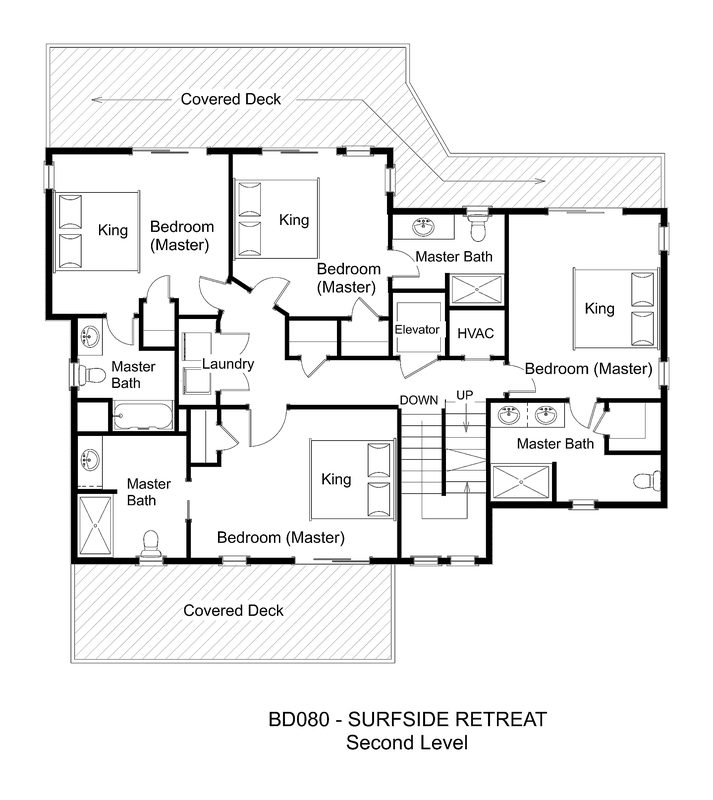 Live it up at Surfside Retreat, a lavish home-away-from-home custom built to help you relax. This pet-friendly oceanfront dream has everything you need and more. From the moment you arrive to freshly made beds and move in with the handicap-friendly elevator to all levels, your stay in this impressive home will be a breeze. There is fun for all in the first level game room with foosball and pool tables, TV, wet bar with dishwasher, and a full-size refrigerator to keep your drinks and snacks chilled and at the ready. The theater room with stadium seating and rear lounge is perfect for Hollywood classics, family favorites, and cheering on the home team. The kids will sleep tight in a bedroom with two pyramid bunks. 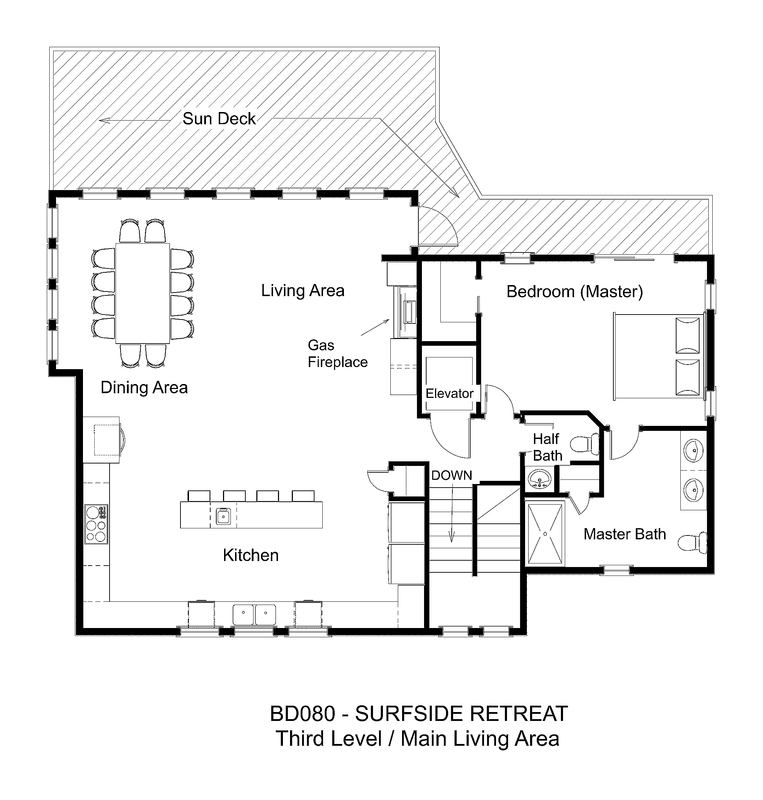 A king bedroom opening onto the oceanfront deck is also on this level, along with a full bathroom off the hall and a convenient half bathroom off the game room. All bedrooms throughout the house have TVs. 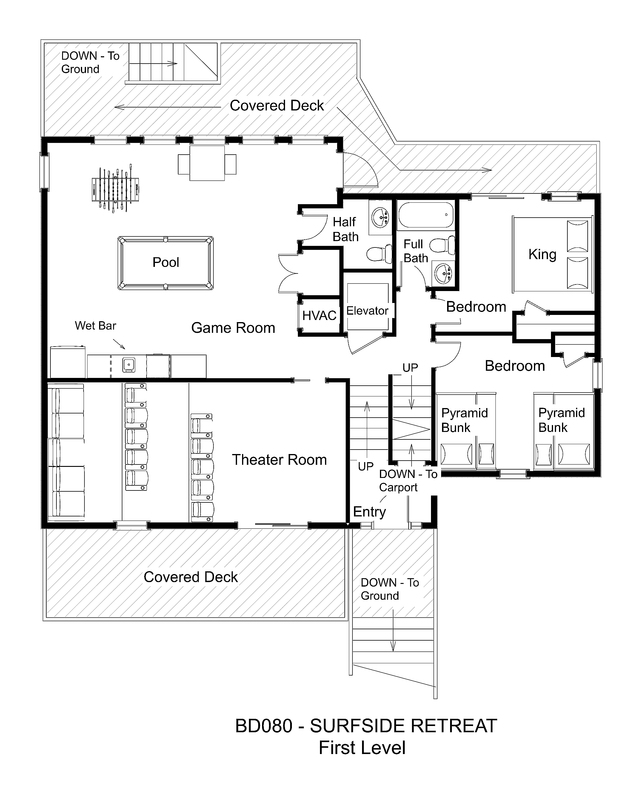 Four spacious king master bedrooms are on the second floor. Three, two with shower stalls in the bathrooms, open onto a spacious shaded deck overlooking the ocean and the pool area. 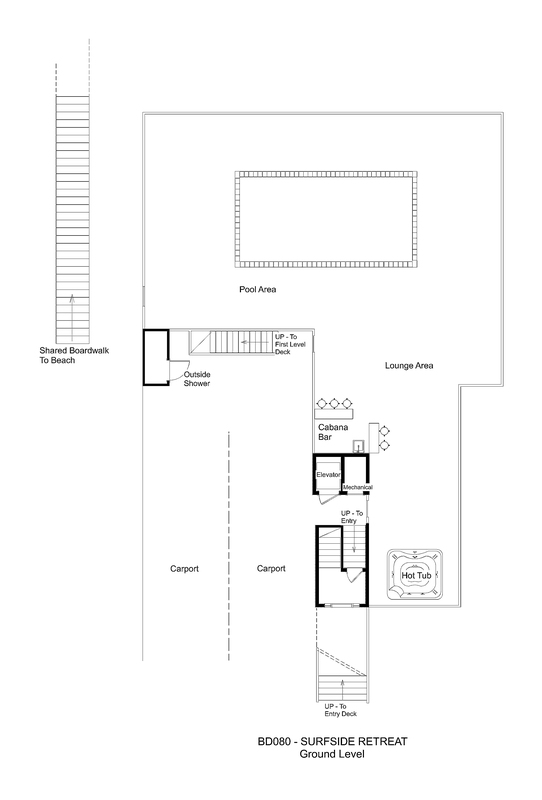 The fourth features a fold-down bench seat in the shower stall and opens onto a private, shaded deck on the front of the home.The laundry area is conveniently located on this level as well. An additional king master bedroom on the top floor features a bathroom with double vanity and extra-large tiled shower, and opens onto a fantastic oceanfront sundeck where you can watch the sunrise light up the sky each morning. Whether it’s just you and that special someone or a whole house full of family, meal prep is a cinch in the deluxe kitchen with wine cooler, 5-burner stove, as well as dual wall ovens, refrigerators, and dishwashers. Cozy up in the living area with gas fireplace, or gather around the dining table for a feast, all without losing sight of the ocean. A half bathroom is also on this level. Good times abound in the ample outdoor entertainment area. Work on your tan from the large pool deck, or sip on something sweet in the shaded lounge area with tiki bar. Make a splash in the private pool with available heat, which features a wet deck and inset kiddie pool, or soak your cares away in the hot tub. The community boardwalk to the beach is your path to fishing, surfing, and beachcombing for hours on end. Take a quick rinse in the two outdoor showers and enjoy a picnic fresh off the gas grill. Get away from it all at Surfside Retreat without giving up the convenience of nearby shopping, dining, and great things to do. Climb the famous Cape Hatteras Lighthouse, enjoy numerous day trips around the area, or simply take a deep breath and relax. You deserve the luxury of a stay at Surfside Retreat. How far in advance does a renter need to indicate they want to pay for pool heating? Are there any kind of baby supplies (i.e. baby gates, stroller, etc.) at this property? Does the house have any sand toys like buckets/shovels, folding chairs, folding shade tent, pool floats, ice chest, or bikes with trailer for kids to ride in? Does this home allow special events? House was beautiful and in a very convenient location. My family had a great trip!